house shopping is quite a task. there's so many things that us gals look for in a house. colors, layout, decor potential, etc. i LOVE decorating, so this was especially difficult for me. when i walk into a house i think what walls would look good painted certian colors, i think which walls would need small framed artwork, which walls would need more of a collage of artwork or a shelving unit etc. 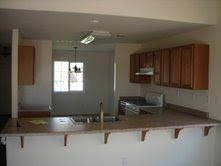 then there's the kitchen... every gal must have a decent kitchen! i also find that a kitchen that opens into the living room is a MUST for me. i want to know that when i have company over that they can all be in the living room socializing and i can be putting the finishing touches on a meal and still be social. so many things to consider. nonetheless we're searching long and hard. we'll see what becomes of any of it.